Chelsea remain unbeaten under Maurizio Sarri, suggesting his team has adapted quicker than expected to his methods, while Everton had a bumpy start under Marco Silva but have since strung together a good run of results to propel them into the top half of the table. 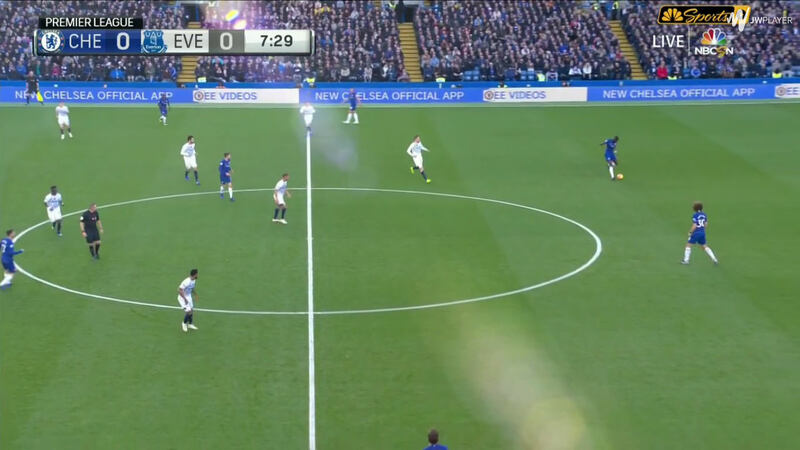 Sarri went with his usual 4-3-3 formation, whereas Silva opted for a 4-2-3-1, as Richarlison led the line ahead of Gylfi Sigurdsson. 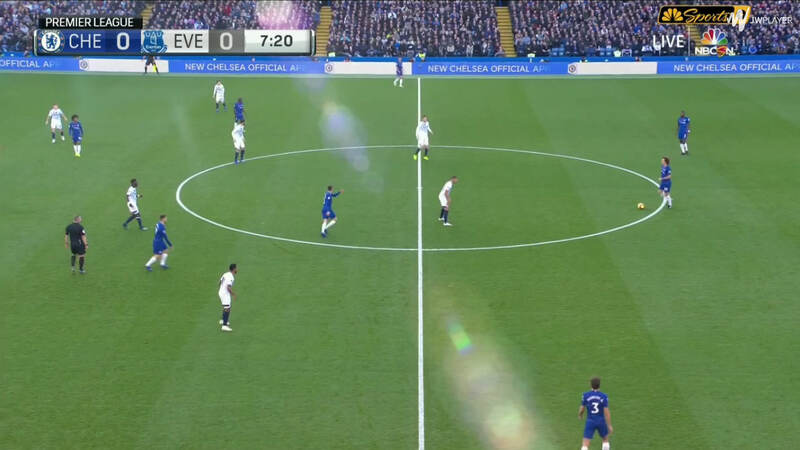 The first half followed a rigid pattern: Everton sat back in a compact 4-4-2 shape, asking Chelsea to play through them. 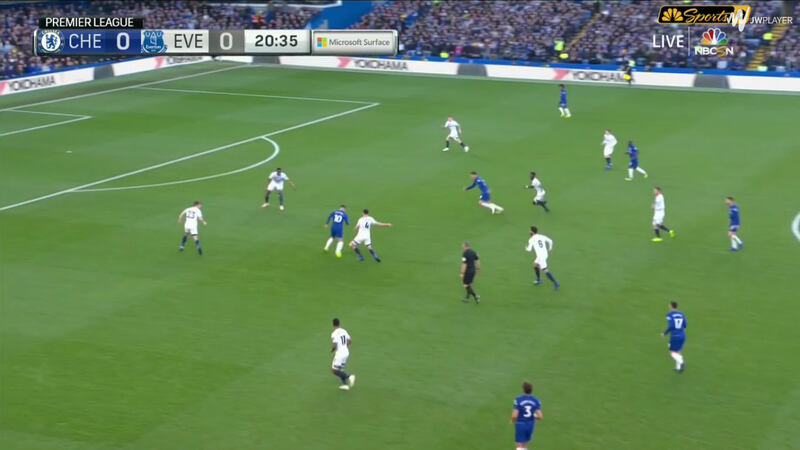 This was very effective for Everton – Richarlison and Sigurdsson would stick close to Jorginho, one occasionally stepping up to press the centre-backs while blocking the pass into him and the other staying close, ensuring that between them they had him covered; the wingers would tuck inside, generally blocking the pass into the wingers behind them and moving out to press the full-backs when the ball was played into them; the centre-midfielders mainly concerned themselves with their opposite number, either blocking the pass into them if they pushed up between the lines or getting close to them if they dropped deeper, to ensure they had no space to work in. There were two weaknesses in this plan though. 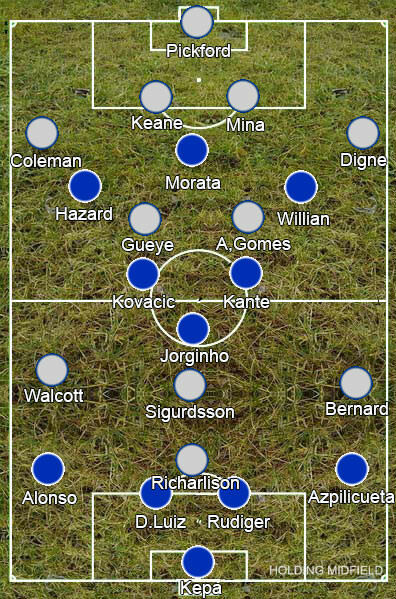 Firstly, Chelsea could attack down the flanks. 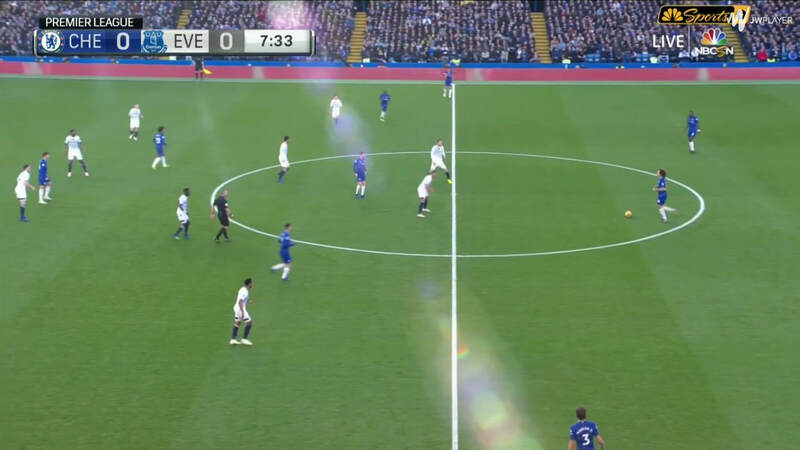 Everton’s wingers tucking in meant that Marcos Alonso and Cesar Azpilicueta had lots of space in the wide areas and while Theo Walcott and Bernard would press them if they received the ball to feet, they were often unsure what to do if the pair bombed forward high up the pitch. Them tucking in and Mateo Kovacic and N’Golo Kante’s tendency to position themselves quite wide meant that it was often the wingers that were picking up Chelsea’s midfielders, so they were reluctant to leave their men as well as being reluctant to track all the way back into defence. 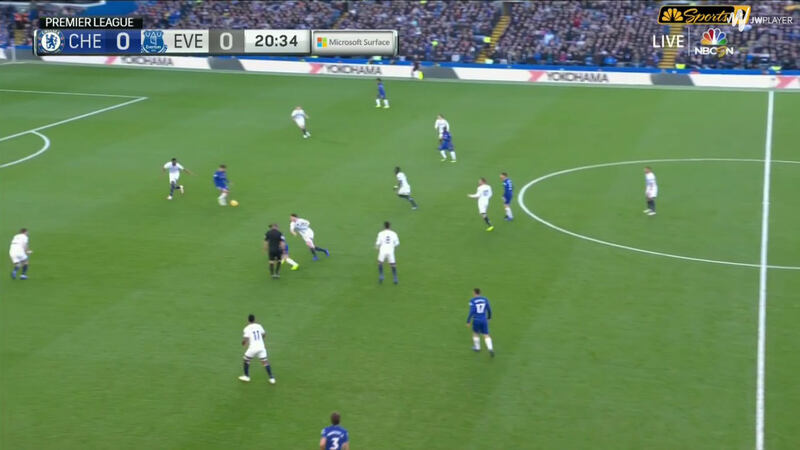 It was rarely simple to pass them on either as Everton’s full-backs were also tucked inside with Chelsea’s wingers. 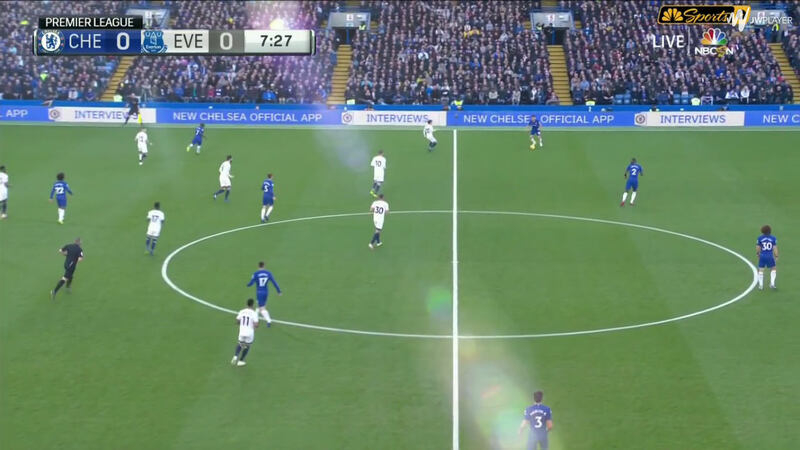 Although this allowed Chelsea an easier way of getting into the final third, what they did once they got there remained a problem, with them rarely carving out decent chances from this area. Secondly, Chelsea’s centre-backs could play straight to the frontmen. Everton’s midfield four was generally narrow enough to ensure there wasn’t big enough gaps between them to make this an option, especially with Sigurdsson and Richarlison screening ahead, but as Idrissa Gueye and Andre Gomes were primarily concerned with denying Chelsea’s midfielders space, there could sometimes open up a gap to slide a ball straight from the back into the striker’s feet. Initially these passes went into Alvaro Morata, and were immediately wasted by his inability to hold up the ball or pass accurately. However on a few occasions, Eden Hazard came into the centre to receive them and give Morata someone to work with. Generally he stayed out towards the left, but the moments where he came more central were some of the brightest of the half, winning a couple of free-kicks in dangerous positions. Everton did have some attacks, although their main focus was on defending. When they won the ball, they would immediately send the ball forward to the attackers, who would turn and play it for Richarlison or the wingers storming forward to run onto. 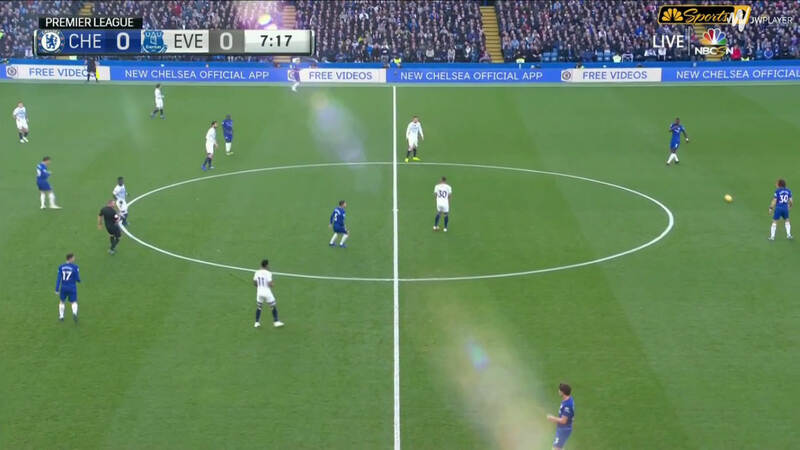 It was simple but they did manage to quickly put Chelsea on the back foot, however they usually had enough cover so that Everton didn’t really threaten. Little changed strategically in the second half, yet it looked completely different. 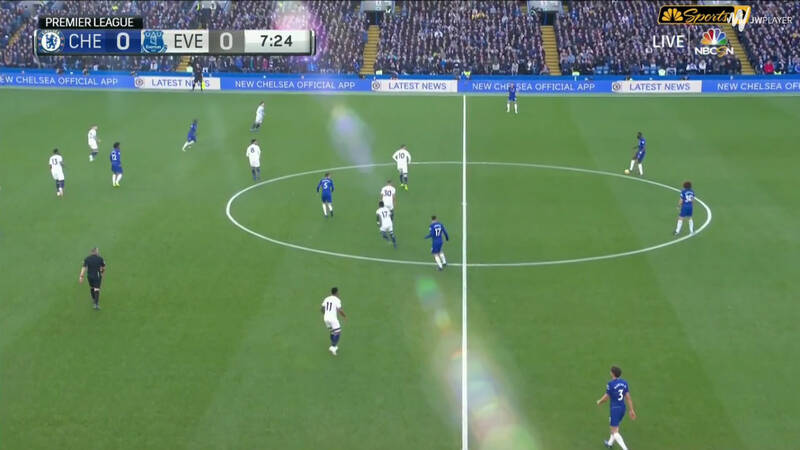 The main difference was that Chelsea upped their tempo, making it harder for Everton to shift across the pitch in time to cut off passing angles – only getting worse as they tired. 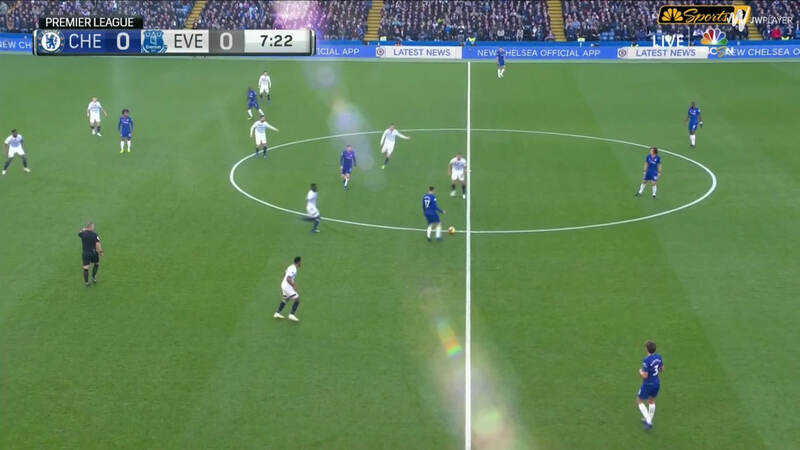 As a result, Chelsea were able to find gaps to play through much easier and Hazard, now playing more through the middle, posed a constant threat as he got on the ball and drived at the Everton defence. 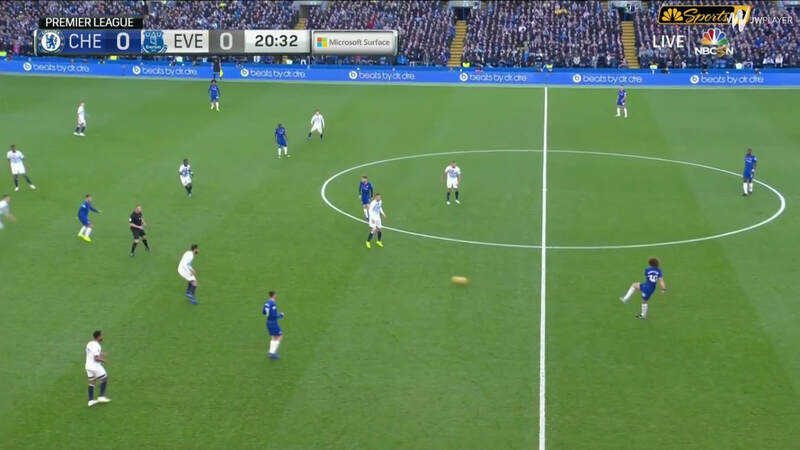 Everton also pushed their full-backs forward more to join the attack, stretching them further and leading to an end-to-end game when it had been cagey in the first half. 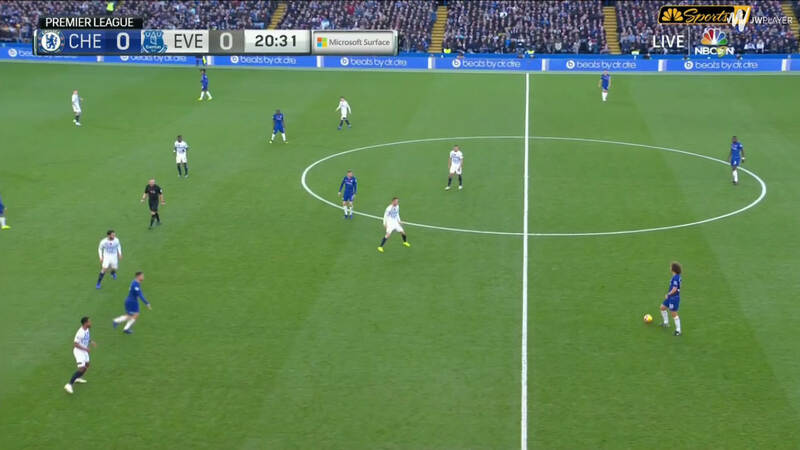 Chelsea seemed closer and closer to getting a goal so Silva changed to a 5-4-1, substituting Sigurdsson for Phil Jagielka to see the game out.